The No. 1 Oklahoma women’s gymnastics team is set for a conference clash with No. 7 Denver Sunday, Feb. 10, at 3 p.m. CT. Though the two teams met already this season at the Metroplex Challenge, OU will travel to Denver for a dual meet between the top two teams in the Big 12. The Sooners hold the season advantage over the Pioneers with a win at the Metroplex Challenge. Behind a record crowd of 5,082, the No. 1 Oklahoma women’s gymnastics team won an epic showdown with No. 2 Florida, 198.325-198.025, on Feb. 1. The Sooners now boast two scores of 198 or better this season as they posted the fifth-best score in program history. Freshman Olivia Trautman had a career night as she set or tied her career high on every event. Making her debut on bars, Trautman took home the all-around title with a 39.725, the second highest score in the nation this season. Sophomore Anastasia Webb was once again stellar, setting her career high in the all-around with a 39.650. Webb posted a season high on three events, scoring a 9.925 on vault, a 9.90 on bars and a 9.950 on floor. On bars, Nicole Lehrmann earned the only perfect score of the night, notching her second career perfect 10. The No. 1 vs. No. 2 showdown did not disappoint as the Sooners broke a pair of program records on Feb. 1. OU tied its record on bars with a 49.725, highlighted by Nicole Lehrmann’s second career perfect 10 on the event. Karrie Thomas added a career-high 9.925 in the rotation, while Maggie Nichols anchored with a 9.975. On floor, the Sooners shattered their previous record of 49.725 with a 49.825 in the final event of the night. Jade Degouveia, Brenna Dowell and Olivia Trautman each tallied a 9.975 on the event, while Jordan Draper and Anastasia Webb added career-high 9.95s. The Sooners are back on the road for the fourth time this season and the first of three road meets in the month of February. On Sunday, the Sooners will look to build upon their 77-11 all-time true-road record under head coach K.J. Kindler. OU has won 16 of its last 17 meets on the road, dating back to 2016. In 13 seasons, OU head coach K.J. Kindler is 68-3 against current and former members of the Big 12 (not including regionals and NCAA Championships). Against current members of the league (Denver, Iowa State, West Virginia), Kindler is undefeated in the regular season with a 32-0 record. Of the nation’s top totals this season, the Sooners hold three of the top four scores. OU is the only team to hit the 198 mark twice, holding the top spot with a 198.325 (Feb. 1) and the No. 2 spot with a 198.050 (Jan. 5). OU also holds the No. 4 spot with a 197.975 and the No. 6 spot with a 197.825. Only two other schools are represented in the top 10 as UCLA and Florida each have three of the top scores. After posting the nation’s highest score of the weekend, the Oklahoma women’s gymnastics team remained the No. 1 team for the fifth week in a row. The Sooners, who tallied a nation-best 198.325 on Saturday, have now been the No. 1 team for a total of 57 weeks since the start of the 2015 season. The Sooners have posted 62 scores of 9.9 or better during the first three meets of the year. With 120 routines under their belts, that means that 52 percent of the routines competed have scored at least a 9.9. The Sooners have put up double-digit scores of 9.9 or better in each meet, tallying 17 against Florida, 13 at the Metroplex Challenge, 12 against Arkansas and 10 each against Georgia and UNC. Of schools currently ranked in the top five Florida has 44 such scores, UCLA has 41, LSU has 31 and Utah has 29. The Sooners have posted a score of at least 197 or higher in 49 of their last 50 meets. Currently, the Sooners’ streak is at 14 meets with a score of at least 197, and nine of those meets have featured a score of at least a 198. Only seven teams have hit the 197 mark this season and the Sooners are one of just four who have scored a 197 or better in every meet (Utah, UCLA, Florida). With a 198.050 in its opening meet, the Sooners became the only team in NCAA history to break 198 in the first meet of the year. OU added a second score of 198 or better with a 198.325 on Feb. 1, the highest score in the nation thus far. The Sooners now have 20 marks of 198 or better since the 2016 season and 27 overall. No other school has more than 18 in its program history. In 2018, OU set the NCAA record with 10 scores of 198 or better in a single season. Below is a breakdown of the Sooners’ individual scores on each event this season, including totals of at least 9.85, 9.9 and 9.95. Senior Nicole Lehrmann has been outstanding on bars throughout her career as a Sooner. She has tallied a 9.9 or better on the apparatus in 78 percent of her routines (40 of 51). In 2018, she strung together her best year yet, notching a 9.9 or higher in 14 consecutive meets. Lehrmann has scored at least a 9.9 on bars in 19 of her last 20 meets, including her second career perfect 10 on Feb. 1. Freshman Olivia Trautman has shined in her first season as a Sooner, earning a career high on floor with a 9.975 on Jan. 19 and Feb. 1. Trautman has recorded at least a 9.925 on floor in all five meets. The freshman has also taken over the leadoff spot on beam, earning a career-high 9.925 on Feb. 1 against No. 2 Florida. Trautman competed in the all-around for the first time in her career against Florida, earning the second highest score in the nation to date with a 39.725. The Champlin, Minn., native set or tied a career high on all four events en route to her all-around score. 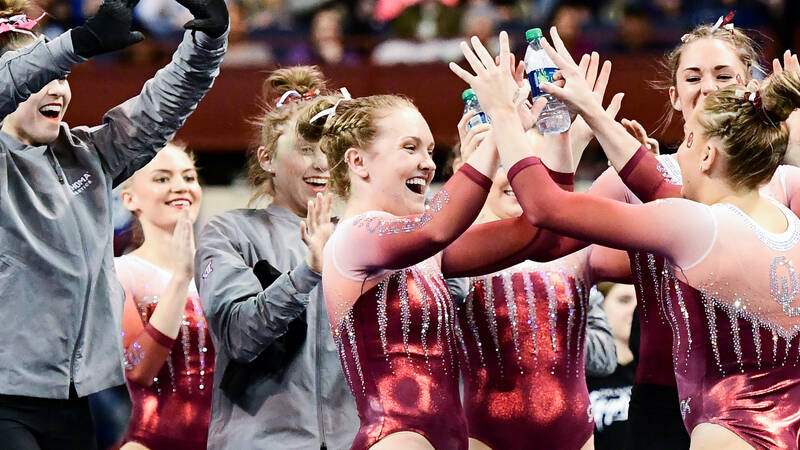 In week two of the season, the world saw the collegiate debut of the “Dowell” – a front double pike named after senior Brenna Dowell in the Code of Points after she successfully executed it at Worlds in 2016. Dowell had yet to compete the skill named after her in collegiate competition but broke it out in her first pass on floor on Jan. 11. On Jan. 19, Dowell set a career-high in the all-around, earning a 39.625 thanks to a career-high 9.925 on beam and a season-high 9.925 on floor. Continuing the success of her senior year, Dowell earned a 9.975 against No. 2 Florida to earn a share of the event title. OU has showcased the depth it has on its roster with 14 Sooners appearing in at least one lineup or performing an exhibition routine. Seniors Brenna Dowell (AA), Nicole Lehrmann (VT, UB, BB) and Alex Marks (UB), juniors Jade Degouveia (VT, FX), Maggie Nichols (AA) and Bre Showers (AA), sophomores Jordan Draper (FX), Karrie Thomas (UB), Carly Woodard (BB) and Anastasia Webb (AA) and freshmen Emma LaPinta (FX), Allie Stern (VT, FX) and Olivia Trautman (VT, BB, FX) have all competed. Evy Schoepfer (FX, BB, VT) and Thomas (BB) have appeared in exhibition. Oklahoma leads the all-time series with Denver 40-8. Under Kindler, the Sooners are a perfect 17-0 all-time against the Pioneers. Head coach K.J. Kindler is just four wins away from 450 career victories. Kindler has also amassed 352 victories as the head coach of the Sooners. Oklahoma returns six previous NCAA All-Americans who own 22 total accolades: Jade Degouveia (VT), Brenna Dowell (UB, VT, FX), Nicole Lehrmann (UB, BB), Maggie Nichols (AA, VT, UB, BB, FX), Bre Showers (VT, AA) and Anastasia Webb (FX). Three of OU’s regular season home matches will be televised live by Sooner Sports TV. The UCLA meet will be carried on ESPN. The Big 12 Championship will be hosted at the Lloyd Noble Center on Saturday, March 23, at 1 p.m. CST and will air on ESPNU. The Sooners will head to Oklahoma City, Okla., for the annual Perfect 10 Challenge hosted at the Cox Convention Center. The quad meet, featuring Arizona State, George Washington, Oklahoma and Washington, is set for Friday, Feb.15, at 6:45 p.m. CT.